Asbury Park, New Jersey is a small but densely populated city along the state’s northern shore. Since its founding it has been a seaside destination and cultural hub. It endured a period of decline in the late 20th century, and although the city is re-emerging today, the progress has been uneven. 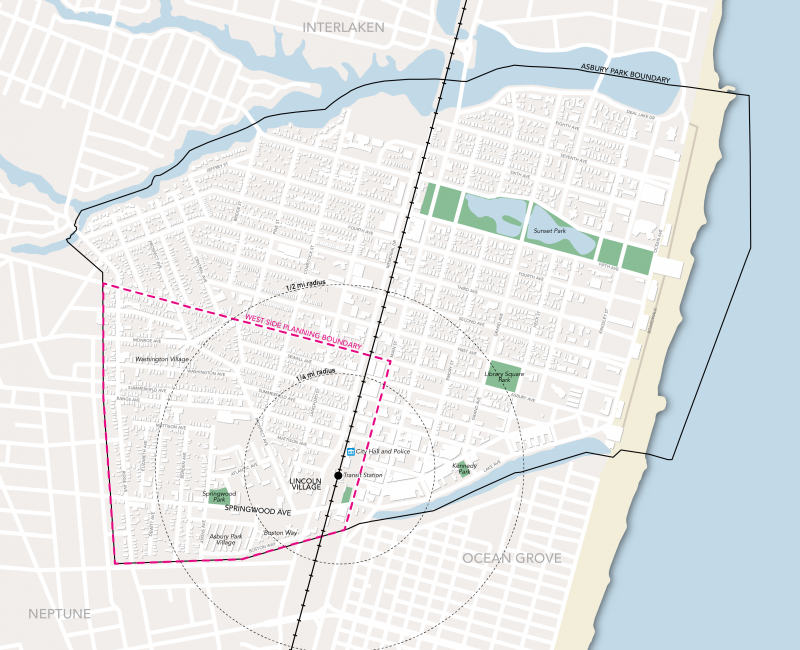 The City of Asbury Park was founded in 1871 by industrialist James A. Bradley, who had a vision of a progressive city utilizing advanced technology such as a trolley system and generous urban design principles, such as wide, tree-lined streets, an oceanfront boardwalk, and parks and churches dotting the city. 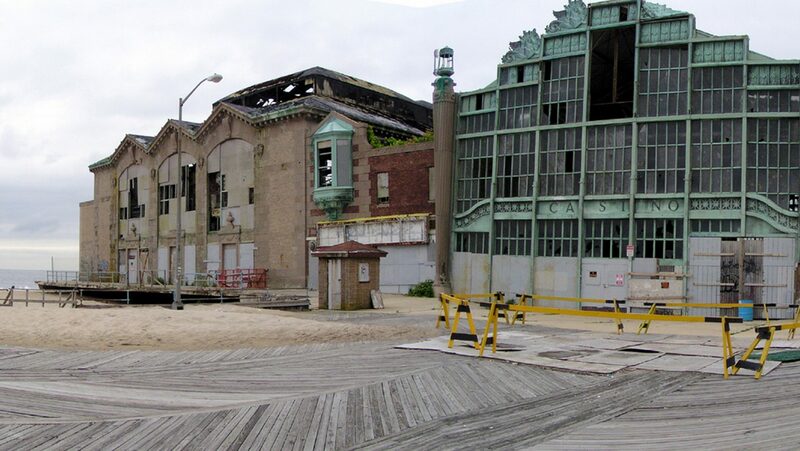 Asbury Park quickly became a tourist destination with amusement parks, casinos, and music venues. The Paramount Theatre and Convention Hall opened in the 1920s, establishing the city as a music and performing arts hub. At its peak, Asbury Park had more than 200 hotels. Most of this amusement activity was centered around the East Side- the oceanfront side- of the city. However, the West Side had an important cultural reputation of its own. 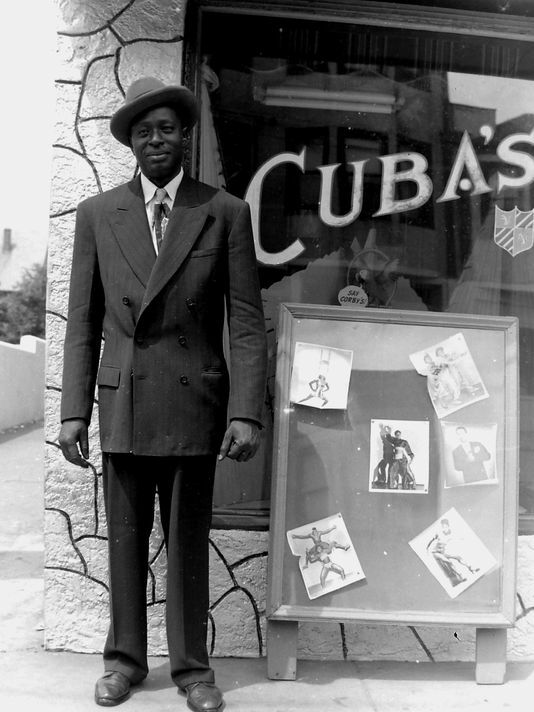 Throughout the early and mid-1900s, Asbury Park was a magnet for up-and-coming musicians who helped develop big band, jazz, and blues music. 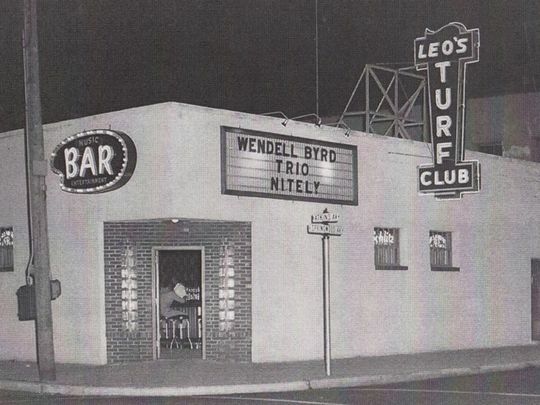 The West Side in particular was home to a thriving African American music and cultural scene; Billie Holiday, Count Basie, and Lionel Hampton all performed in the neighborhood’s music clubs. Springwood Ave was the major east-west commercial corridor on the West Side, while Cookman Ave served as the major commercial corridor on the East Side. 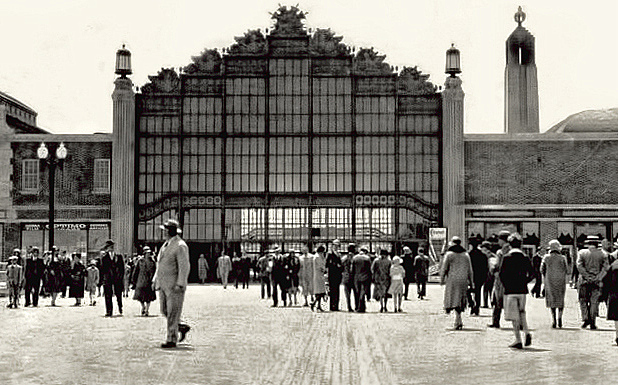 Asbury Park’s population and popularity as a vacation destination started to decline due to the rise of suburbanization and highway culture, particularly struggling after the opening of the Garden State Parkway in 1955. Other factors like the opening of regional shopping malls and the ability of families to fly to further-flung vacation destinations further depleted the city’s economy. Despite these struggles, Asbury Park remained a haven for musicians and artists. Bruce Springsteen spent time here and wrote many songs about the city. The Stone Pony, now a legendary rock venue, opened in 1974. 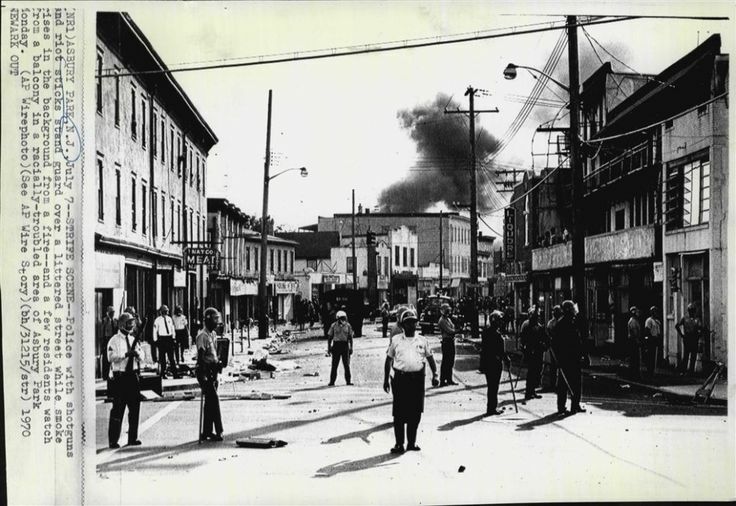 Like many other cities at the time, divisions and racial strife erupted in riots in July 1970, lasting four days and resulting in numerous injuries and widespread property damage on the West Side. Most damage was done to businesses and homes along Springwood Ave; many buildings were burned to the ground. 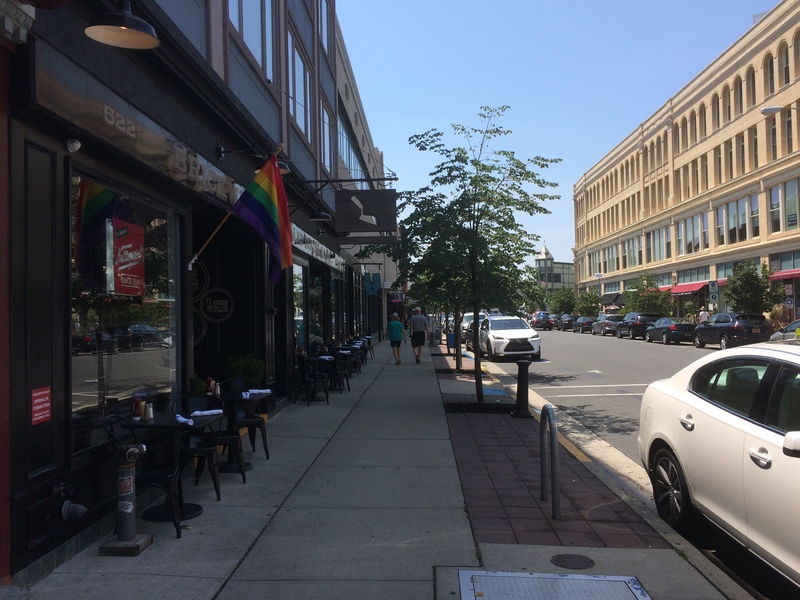 The commercial corridor was dramatically altered into a condition that has persisted to present day: large swaths of vacant land on both sides of the street. 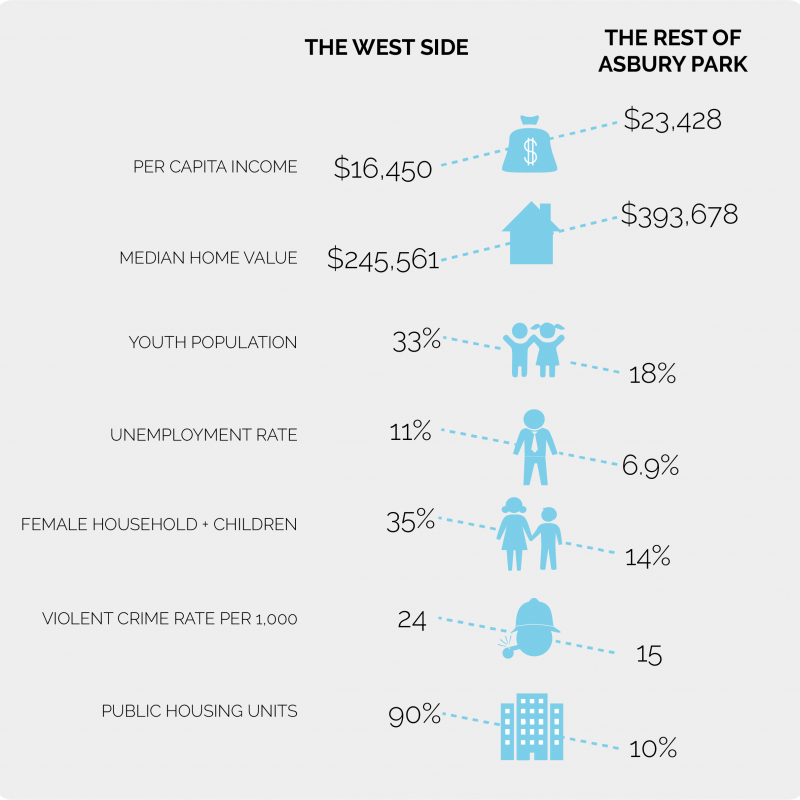 With the recent economic turnaround following the Great Recession, the East Side of Asbury Park has re-emerged as an increasingly popular shore destination once again. The boardwalk underwent an extensive restoration process in 2007 to revitalize key facilities and attract new businesses and activity. Cookman Ave is now bustling with new restaurants and shops, and new music venues have popped up alongside the longstanding and iconic music halls that have stood the test of time. Over 500 units of new housing have been developed in the past 10 years, including some currently under construction. Asbury Park is gaining regional and national attention as a tourist magnet with new attractions, fine dining, and new hotels. Nearly all of this new investment has occurred on the East Side, primarily along the waterfront and on Cookman Ave. However, very little of this resurgence has spilled over to the West Side, on the other side of the train tracks that bifurcate the city. Despite Springwood Ave’s proximity to Cookman Ave, very few new businesses have opened in recent years and much of the street frontage remains as vacant land leftover from the 1970 riots. 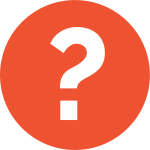 A vast majority of the city’s African American residents live on the West Side, as does a significant portion of the Hispanic population. The West Side also hosts three of the city’s four public housing sites, creating a concentration of lower-income residents. Today, Asbury Park feels like a tale of two cities: resurgence on the east side of the train tracks, and stagnation and frustration on the west. However, there are signs that the East Side’s development pressures will soon arrive to the West Side. New affordable and mixed-income developments are slated for many of the vacant parcels along Springwood Ave, and the street has seen two major recent changes: the Springwood Center, a mixed-use facility housing apartments, a senior center, a business development center, and a cafe; and Springwood Park, which opened in summer 2016. Streetscape improvements have also recently been made by the city, with new lighting, curb cuts, and street trees lining the avenue. Momentum is building for rapid change on the West Side. 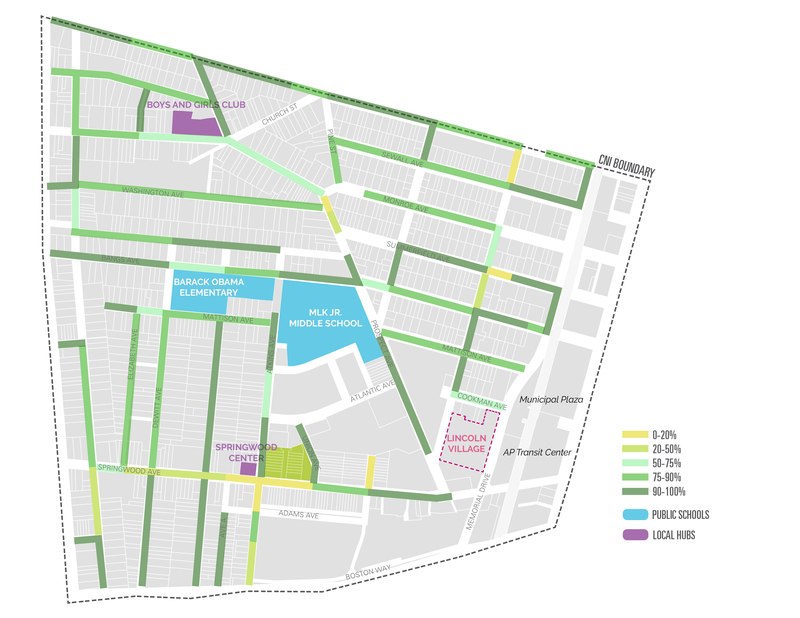 The One City Asbury Park Choice Plan is consistent with past plans and redevelopment guidelines that pertain to the West Side neighborhood. The 2008 Main Street Redevelopment Plan calls for, among other things, a Civic Core and City Gateway near the intersection of Main Street and Springwood Ave, including a redeveloped municipal plaza. 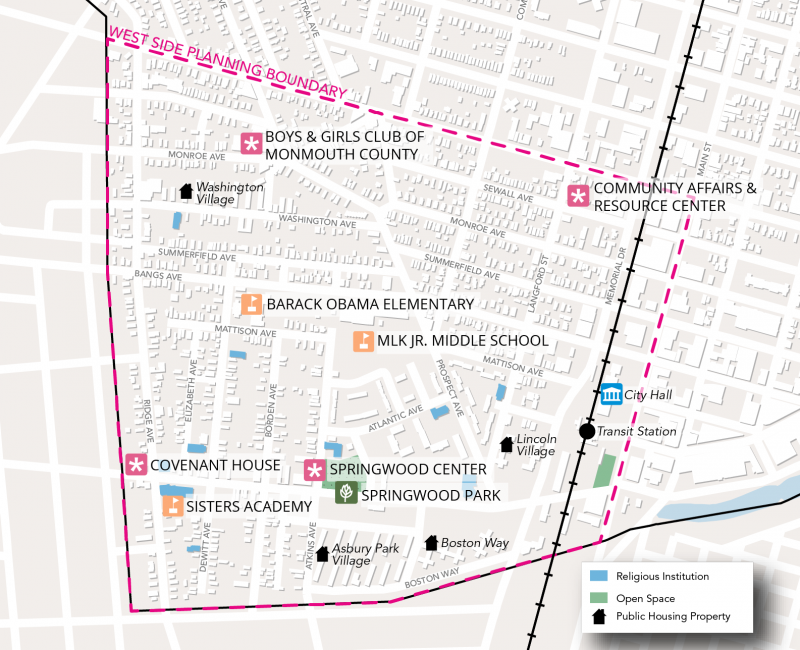 The 2016 Amended Springwood Ave Redevelopment Plan extends that gateway zone from Memorial Drive west to Sylvan Street, as well as signifying residential and neighborhood commercial zones further down the corridor. 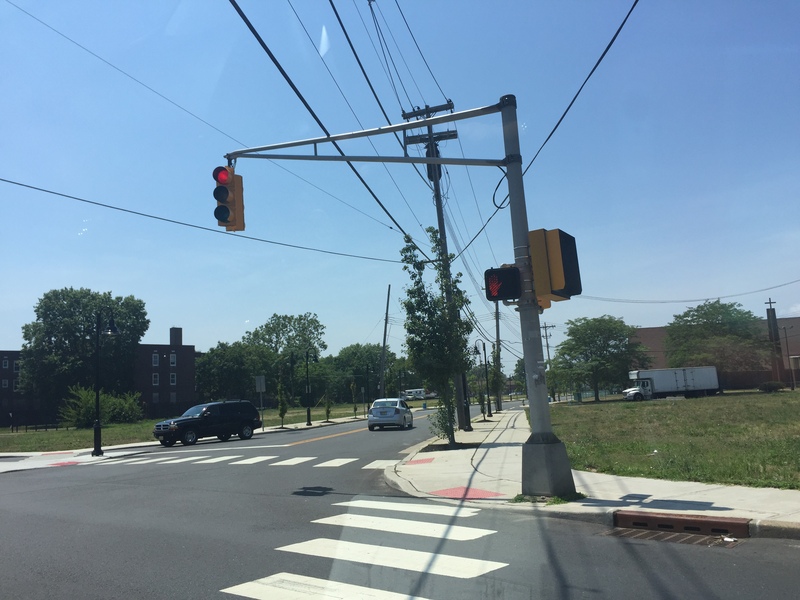 Other relevant plans and programs include the 2017 One Asbury Park Workforce Strategy, the Transit Village designation by NJDOT, and the city’s Opportunity Zone designations, one of which covers the western portion of the neighborhood. 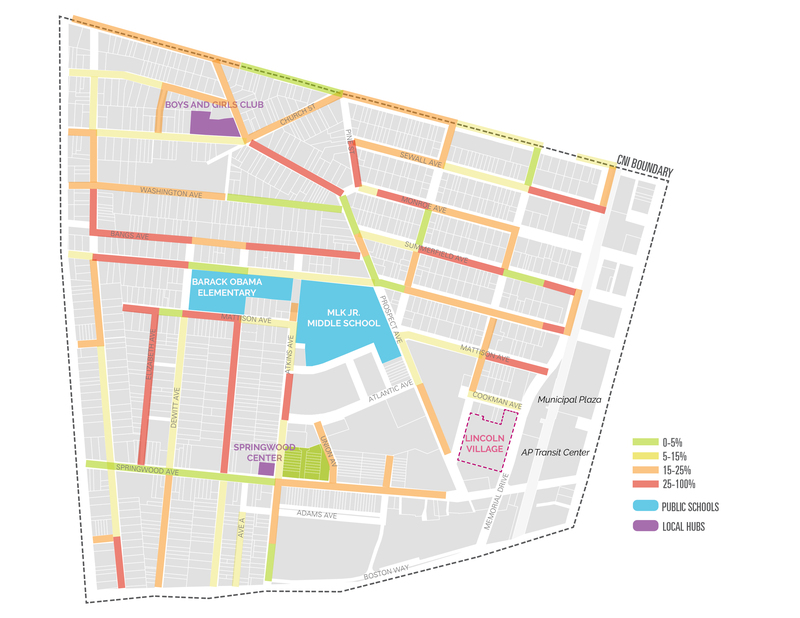 Finally, the recently completed Asbury Park Master Plan and Reexamination Report (2017) outlines a similar seamless vision for the city’s development over the next ten years.